Last year, Socialist Michelle Bachelet reclaimed Chile’s presidency after four years of center-right rule and restored power to the Concertación coalition that had governed the country since re-democratization. For progressives, and even some radicals, her election makes possible heretofore elusive popular reforms. They claim that a recent movement upsurge has supplied the necessary steam to complete the transition to democracy that Chile’s center-left has thus far been unable to accomplish. With the backing of the Pinochetist Alianza at historic lows and an expanded reform bloc, now christened New Majority (NM), and bolstered by the rise of a new generation of young Communists who headed massive 2011–12 student mobilizations, the prospects for pushing through changes beneficial to workers, students, and the rural and urban poor appear well founded. There is no question that Chile’s workers and poor are better positioned today than they were just ten, to say nothing of twenty, years ago. Indeed, popular forces enjoy the most auspicious balance of power since the 1973 coup that stamped out Chile’s democratic road to socialism. And Bachelet did shepherd through a series of reforms in her first year, including higher education legislation that attracted international attention. But obtaining a firmer grasp on the prospects for emancipatory politics in Chile calls for examining both the electoral results and first-year reforms in relation to elite interests and movement strategies. Such scrutiny reveals an unequivocal preservation of bipartisan oligarchic neoliberalism, along with continued extra-institutional opposition from merging movements. Developments going back a century have shaped the current conjuncture. First, the country’s economic conditions generated a process of class formation that produced a socialist workers’ movement and Marxist-led, independent radical unions in the early twentieth century. Workers looked to the Communist (PCCh) and Socialist (PS) parties to guide their struggles against employers and the state. Rising class conflict converged with the failure of postwar developmentalist governments and the activation of students, peasants, and the urban poor, culminating in the election of Socialist Salvador Allende in 1970. Taking advantage of elite divisions, Allende’s Popular Unity (UP) coalition, led by the PCCh and the PS, pursued an improbable socialist transformation without institutional rupture. Meanwhile, new left forces engendered by erupting movements, notably the insurrectionist Revolutionary Left Movement (MIR), challenged the UP from the left, widening a revolution-from-above versus revolution-from-below rift in Chile’s road to socialism. By contrast, elites reunited, instigating the 1973 coup that wiped out a generation of militants and their organizations. Reaction to the UP experience has also acutely shaped the present. The junta under General Augusto Pinochet ushered in a neoliberal transformation of Chilean society through the barrel of the gun. With the MIR physically eliminated, the PS in exile, and the PCCh tortured, disappeared, and scattered, Pinochet’s military regime installed neoliberal orthodoxy, enshrined in the 1980 authoritarian constitution. It outlawed the Left and rigged future electoral rules in favor of minority right-wing elites. The junta disempowered unions, deregulated markets, and re-commodified social goods like land, health care, pensions, and education. Indeed, one of Pinochet’s final decrees formalized the prevailing privatization of education by decentralizing schools’ administration and funding, and establishing a voucher system that transferred public money to low-quality venture schools. Despite pro-market mythologies, the crises and hardships caused by savage market reform triggered mass mobilizations during the early to mid 1980s. Under popular pressure, the regime was forced to consider a return to democracy. To secure a managed transition, elites, supported by the United States, brokered a deal in which free elections would be granted if the opposition accepted free-market reign and deactivated movements. With the MIR all but extinct and the PCCh marginalized, the PS joined their former foes, the Christian Democrats (DC) to lead the center-left coalition that governed from 1990 to 2010. Two decades of Concertación rule amounted to a neoliberal democratic regime that undermined popular participation, left Pinochet’s charter unchallenged, and harshly repressed any sign of protest. Able to secure majorities while promoting elite interests, the center-left consistently beat out the hard-right neoliberal Alianza coalition. Unsurprisingly, growing inequality and oligarchic rule fostered new mass movements with expanding and deepening grievances. The 2005-6 high school rebellion against Bachelet’s first government was a watershed signaling a qualitative leap in popular mobilization. Frustration with the Concertación set the scene for the Right’s presidential victory in 2010. The optimistic scenario anticipated by left analysts celebrating Bachelet’s second election presents another near-epochal shift in Chile’s polity. This perceived realignment is said to be driven by the irreversible decline of the hard right. After competing steadily with the Concertación since re-democratization and finally surpassing its historic 40–45 percent threshold to win the presidency in 2010’s second-round elections, the Alianza’s ability to rule seems buried for the time being. This unprecedented rejection allegedly clears the way for a revival of Allende’s dream of true political and economic democracy. The sanguine scenario is reinforced by the undeniable influence of emerging mass movements credited with pushing the dominant electoral bloc as well as the national policy agenda unequivocally to the left. As wider swaths of non-elites reject market orthodoxy and increasingly identify with mounting protest, a period-defining shift in public opinion appears to be taking hold. Some of the young Communists — including the iconic Camila Vallejo, former spokesperson for the university student union confederation (CONFECH), and their allies who led the 2011–12 protests that shook the foundations of Chile’s neoliberal model after years of quiescence — have been elected to Congress. With favorable street sentiment and parliamentarians agitating in Congress, the general feeling is that the core features of NM’s platform — tax, education, and constitutional reforms (including changes to the restrictive binomial electoral scheme) — are nearly certain. Furthermore, progressives in this culturally conservative society feel well-positioned to expand “social” rights including gay marriage, gender identity protections, and even “therapeutic” abortion. Even some radical autonomists advance the notion that Bachelet’s inauguration is the culmination of decades of democratic struggle from below. So what power does the Left have electorally? Despite the momentum of the recent upsurge, first-round abstention in the 2013 election was still 50 percent — less the result of newfound disappointment or apathy than the recently acquired ability to lawfully sit out elections. Cutting both ways, such middling participation levels reflect the large chunks of Chilean society defeated by neoliberal exclusion as well as newly activated layers looking for options beyond current partisan offerings. Together, Alianza and the former Concertación received over five-sixths of all votes. Due to the “top-two-winners-take-all” binomial system, together they grabbed 96 percent of House seats and 100 percent of Senate posts. Electoral rules guarantee the two dominant blocs roughly equal shares of seats. In fact, since coalitions are all but ensured district representation, often candidates don’t compete against “opposing” parties, instead fighting their partners for each bloc’s reserved spot. In addition, despite Alianza’s poor showing in the presidential race, the legislative results are perfectly consistent with their tallies since re-democratization — 40 percent in the lower house ballot compared to 43 percent in 2009 and 39 percent in 2005. So even while a leading consultant for the hard-Pinochetist wing of Alianza lamented that “in the last few years the right has suffered a powerful cultural defeat,” the right coalition remains a solid pillar of the regime. Concretely, this translates into a twenty-one to seventeen advantage in the Senate and a sixty-seven to forty-nine edge for the center-left in the lower house. In effect, although the Communist votes shifted the center of partisan gravity slightly to the left, the duopoly that has shared power since 1990 remains intact. Not only do these results suggest that the pro-Pinochet right is far from buried, more specifically they cast doubt on the ability of NM to deliver on its promises. If the powerful right-wing of the bloc cooperates, Bachelet may muster the simple majority needed to pass tax reform. Still, the inclusion of the PCCh in NM should not be derided outright. After all, there is a reason the Concertación resisted Communist advances for twenty years. 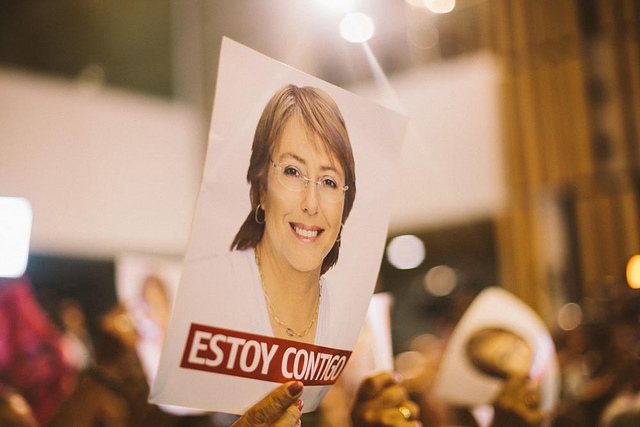 Though PCCh president Guillermo Teillier raced to the front of the class to diligently announce that Communists will not “make waves” against Bachelet’s second tenure, the party’s ability to discipline its new blood is no foregone conclusion. Besides Vallejo, who led her district balloting with 44 percent, her co-thinker, Karol Cariola, a former leader of the historically radical University of Concepción students, also won handily with 38 percent of votes. Furthermore, Giorgio Jackson — the head of the new and theoretically independent Revolución Democrática, a former CONFECH co-spokesperson, and president of the traditionally conservative Catholic University students — easily won his district. Though Vallejo and Cariola — as well as rookie Daniel Nuñez — have never displayed the independence of other members of PCCh’s new generation (such as copper federation leader Cristián Cuevas), their party loyalty doesn’t make them outright fools. They know why people voted for them, their instincts having been sensitized during their time at the head of the student insurgency. And while it’s true Vallejo has broken her vow to never support Bachelet, it remains to be seen whether she drops her pledge to use the legislative tribune to stimulate pressure from below. A third student leader facing no such dilemmas is Gabriel Boric of the recently formed Autonomous Left (IA). Though independent left forces garnered roughly 7 percent of the vote, Boric will be their only legislator. IA rose to prominence on campuses after students rebuked FECh leadership for supporting a Concertación-mediated truce to the educational conflict. Right when the international press was trumpeting Vallejo, Boric was defeating her in the election for FECh president on a platform that emphasized strengthening militant and autonomous grassroots movements. Over a year later, demonstrating that independence from NM might be an asset rather than a liability, Boric came in first in his Patagonian district, ahead of establishment parties. On election night, as the progressive left was celebrating early results, Bachelet’s campaign was far from euphoric. Fewer than one hundred supporters showed up to the rented space to cheer her December victory speech as they cagily bobbed to generously amplified cumbias. What was happening? How could the very movements deemed to be supporting the democratic aspirations of Chile’s center-left be using their tested disruptive tactics to frontally clash with the Concertación and its new Communist Youth allies, themselves spawned by the movements? How could the very forces that finally put reform on the national agenda after twenty years of stringent neoliberal democracy offer such a radically different read of the moment? In fact, the analysis of the disparagingly nicknamed ultras is not so different from the strategic understanding of Concertación oligarchs. The brokers of Chilean neoliberalism that emerged from the transition candidly view the moment as a chance to restrict changes to post-Pinochet rules of the game. Like the regime managers they are confronting, the new radical forces understood a basic fact about these elections. Chile was deciding on far more than its next political authorities: the country’s convulsed political and social forces are assessing the magnitude of the reforms needed to change the post-authoritarian regime and the role that growing movements should play in achieving them. Besides the massive student protests that occurred throughout 2011 and 2012, there have been so-called regionalist movements: a Patagonian mini-commune confronting special forces of Chile’s militarized police for days; environmentalists leading street rebellions to challenge mining and hydroelectric projects (enjoying the green light of both electoral blocs); shanty mortgage debtors organizing and making class demands; and Mapuche indigenous communities’ struggling against national oppression in what can only be called a low-intensity counterinsurgency war by the state. The new radicals reject narratives of democratic culmination and shared goals. The elections, in their view, concealed the true contest between those seeking to expand independent class capacities and those aiming to dissolve them under prolonged democratic neoliberalism. The two groups base their strategies on clashing premises: in broad terms, the latter argue that Chile’s fragile democracy needs to overcome fetters imposed by the dictatorship to address inequality; the former, by contrast, are focused on toppling the regime itself. Hence, whereas the latter pitch policy changes as the culmination of a coherent and linear drive to address institutional vestiges of military rule, for the former the existing form of democracy is itself the central problem. The surest way for NM to set the stage for policy victories would be to dispense with the binomial system. But while NM would numerically benefit from such a constitutional makeover, the measure’s net gains would be less certain for the coalition. Left forces would be the biggest beneficiaries, to the detriment of the exclusionary regime from which the Concertación has profited most. As a leak by former president of the Alianza’s hard-right UDI party Patricio Melero revealed, Socialist and DC chiefs have confided concern that a poor electoral showing by the Right would weaken valued counterweights to demands from the Left both within and outside the bloc. Concertación oligarchs are foremost committed to the restrictive bipartisanship that undergirds their political reproduction. Accordingly and as if aiming to publicly humiliate its new junior partner, NM roundly and publicly rejects the PCCh-promoted Constituent Assembly, preferring to stick to existing procedural rules allowing only the faintest modifications to current schemes of representation. Still, to ensure political success, NM has real interest in achieving reforms. To that end, Communists, and even progressive Concertacionistas, not only appreciate the value of grassroots pressure, but, in a noteworthy departure from their prevailing anti-popular positions, may even promote mobilizations to win elite-approved policies and safely channel the upsurge. But with independent forces on the move, calling people onto the streets for narrow political gain carries daunting risks, especially with the Right appearing to be in disarray. Put simply, it may give insurgents opportunities to protest without the ability to contain them. If NM fails to act and appears ineffectual, however, the coalition will pay an incalculable price, and the regime’s legitimacy will continue to dissolve. Its aim then is to get ahead of any mobilizations and push through uncontentious reforms, taking advantage of the elections’ momentum to display quick results. Perhaps most decisive will be how radicals respond to NM’s opening salvo. Their tactics, for one, will condition the decisions of disgruntled Communists. More generally, this new, new left will concentrate its energies on reactivating the student movement and expanding mass popular defiance to pressure for more transformative reforms. Grasping the inherent limitations in student capacities, this diverse array of independent revolutionaries shares a commitment to building a broader insurgent force that centrally involves workers, their communities, and their organizations. They seek to strengthen the preliminary alliances woven at the height of the 2011 mobilizations and expand the organized forces pressing for change outside of the institutionalized rules of the game. In so doing, they look to expose the regime’s duopolistic character as the main barrier to political and economic democratization. In short, they hope that the steam mustered for more egalitarian and emancipatory policies overwhelms the regime altogether. A major obstacle, perhaps unsurprisingly, is disagreement among new autonomous left forces. The very reason that the Autonomous Left (IA) and Boric, after ushering out the Young Communists, were displaced from FECh leadership by Sepulveda is an ostensible “strategic difference” that threatens coherent radical action. IA favors consolidating the student movement as the period’s most advanced anti-regime contingent, while simultaneously building a genuine dissident presence within state institutions. Boric’s first-place finish demonstrates that in the context of rising struggle, anti-regime forces can position themselves independently within the state (a proposition frustratingly corroborated by Vallejo and Jackson’s electoral successes). Sepulveda and leadership of the new Libertarian Students Front (FEL), in contrast, look to orient extant student forces toward galvanizing a non-CUT working class pole eschewing all contention for spaces within the dictatorship-bequeathed state. Their insistence that the broadly influential campus rebellions must branch out “transversally” is equally well-taken. The regime’s difficulties will no doubt facilitate a growing militant challenge, but radicals’ ability to exploit the opportunity remains unclear. After deploying both traditional and innovative organizational resources and devising methods linking secondary and university grievances, the student movement is at a crossroads. After taking advantage of deepening elite divisions and developing strategies to agitate and pull public opinion behind a broad anti-neoliberal program, there are key decisions to be made. Activists built the movement in accordance with rising demands and real conditions on the ground, avoiding getting bogged down in cart-before-the-horse debates around regroupment or formal party blueprints. These qualitative advances have raised a new set of challenges. Now that popular insurgency is back, deciding on the most effective strategies is crucial. Though progressives have celebrated Bachelet’s accomplishments, correctly pointing to the quick succession of tax, educational, and voting reform, the claim that movements have pushed her to “deneoliberalize” is off the mark. Bachelet’s reforms, while impressive prima facie, were not only elite driven, but crucially aim to undermine popular capacities and interests. Rather than integrating non-elite layers into a socially democratizing regime, NM’s moves attempt to preserve the exclusion, fragmentation, and lack of leverage of popular sectors. In short, rather than a push from below, Bachelet’s reforms represent a push back from elites. To date, the NM government has approved tax, electoral, and education legislation, and Bachelet is proposing amendments to Pinochet’s labor code. Corporate tax rates have been effectively raised to 25 percent, ostensibly permitting the state to collect 21 percent of GDP in tax revenues. However, this proportion is still far below the 35 percent of GDP raised on average by OECD countries. Worse still, cooked up in a backroom deal that excluded Communist legislators, the reform leaves in place Chile’s convoluted “integrated” tax system — a scheme in which corporate taxes are refunded to individual businessmen. On the electoral front, NM conjured up veritable smoke and mirrors. Though a proportional representation system has replaced the binomial regime, voting outcomes will actually bolster two-bloc rule. As a recent analysis demonstrates, the gerrymandering that accompanied the rule changes mean that smaller, left parties will fare worse than before. Lastly, Bachelet’s educational reform is anything but a crowning achievement. While alleging to have taken profits out of instruction and banned screening of “underprivileged” students, the legislation, wisely passed while students were on summer break, contains loopholes benefiting business interests (many closely allied with Concertación oligarchs) that resist the loss of this lucrative territory. This first step in what the government says will be a series of complementary measures is a confused move that barely scratches the surface of the changes needed to institute free, quality, public education for all. And the labyrinth of proposals coming down the pike appears to erect barriers to the basic refoundation of popular and public education for which students and their families have been fighting. Labor reform proposals, far from pleasing anyone in the labor movement, have catalyzed levels of worker resistance unseen in years. Despite Figueroa’s satisfaction, even pro-NM union bureaucrats are grumbling about continued proscription of industry-wide bargaining, a policy that undermines the institutional positions of conservative officialdom. Teachers are in outright rebellion, and dock workers have led a series of wildcats strikes paralyzing Chile’s export-led model. Meanwhile, though college campuses have fallen relatively silent, the formerly competing radical autonomists have joined hands to preserve control of most federations. With student unity advancing, we can only hope that a broad movement rooted in independent working-class capacities and committed to overturning Chile’s post-authoritarian neoliberalism can once again place genuine political and economic democracy on the national agenda.